Pristine shorelines that put the Caribbean to shame, picture-perfect whitewashed houses enveloped in hydrangeas, and lobster on every menu- this is what makes Martha's Vineyard such an exclusive holiday destination for the true 1%. So the Vineyard isn't exactly the first place you'd think of when planning a student-budget friendly getaway. But hear me out, the Vineyard can be kind to your wallet, as long as you do your research! And that's exactly what I did when Ben and I decided that we would take two days to explore the island during his second trip to the US. And when I said "decided" I really mean that it was assumed that we would go considering my great love for the Vineyard and Ben's fascination with the preppy New England lifestyle. So once it was settled that the Vineyard was happening, so to speak, we (and by that I mean "I") planned out the various ways in which we could enjoy our stay without emptying our bank accounts. 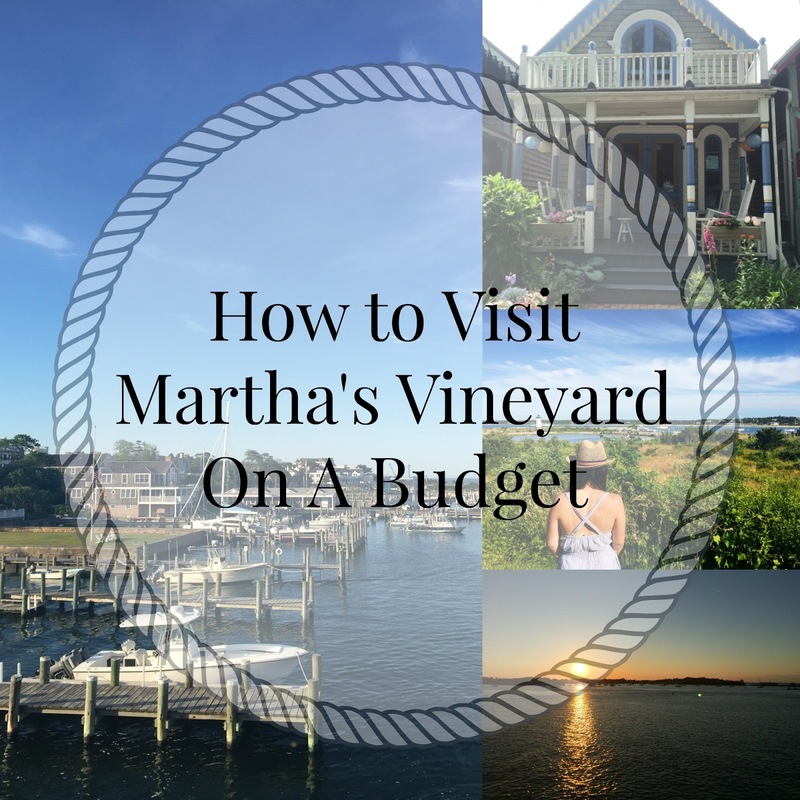 This post will cover the highlights of our trip, as well as provide some tips on how you can make the most of the Vineyard on a shoestring budget! There's really one way, and one way only, to get to Martha's Vineyard- and that's on the Steamship Authority ferries which set out from the mainland every half hour or so. Of course, you could always fly into one of the Vineyard's two small airports, but trust me when I say it will cost you a pretty penny. 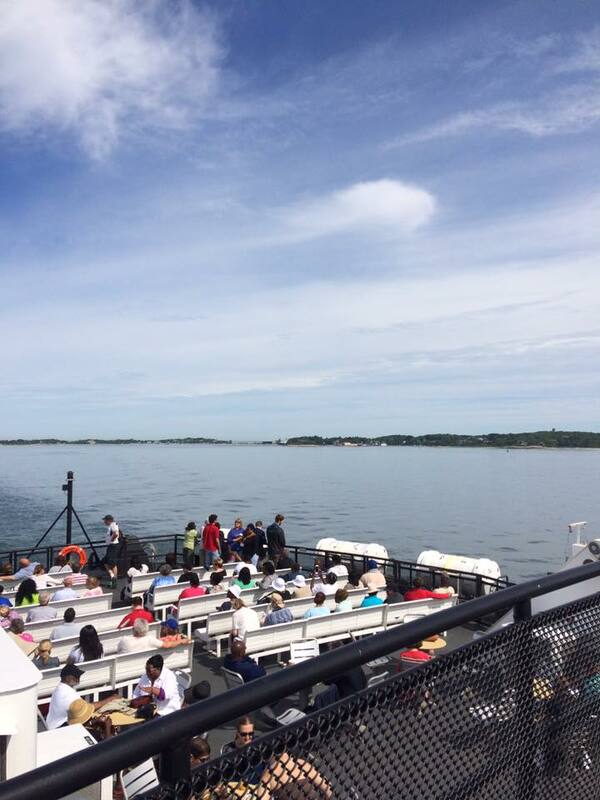 Instead, hop on any of the ferries, and spend a reasonable $17 on your roundtrip ticket. Speaking of transport, you can pay just $8 more to bring a bike along. This is what we did, and it saved us so much money in the long run! I was so nervous to be biking around the island, but you just have to be smart about mapping out your routes. The Vineyard is a lot hillier than I remembered and while the bike paths are clearly marked, be prepared for a few busier roads. Honestly, the main reason why I was so anxious was because I'm not the most experienced biker out there. But the breathtaking scenery of the island and courteous drivers put me at ease (after a few cuts here and there). You also have the option of the public bus (only $1.25 per town) if you don't want to bring your bike or if it's too dark out to cycle. Keep in mind though that the buses can only take three bikes aboard and depart fairly infrequently (every hour or so). I definitely faced a bit of frustration when we had to bike all the way from Aqquinah back to West Tisbury (about 7 miles) because two girls with bikes had beat us to the bus! But when you're on island time, you just have to go with the flow. When I've been to the island before, I've stayed in many different places. This has included a friend of a friend's house (great if you have a connection), the luxurious Lambert's Cove Inn, and the classically beautiful Kelley House to name a few. And each time I've completely enjoyed my experience- not because of where I stayed but just because I love being on the Vineyard! So in the end, I don't think it matters so much where you stay, but how much you utilize the island itself. To keep to our minimal budget, Ben and I sought out the only hostel on the island- a quaint beach house style building run by Hostelling International. I've stayed in a few different hostels before and this one took the cake for being the friendliest! From the talkative staff to the complimentary breakfast of whole wheat pancakes, fresh local bread, and homemade jams, this hostel had a fantastic atmosphere. While we didn't spend a ton of time in the hostel, our experience as a whole was excellent. And at only $36 for a mixed dorm per night, it's the best deal you'll get on the island. If hostels aren't really your thing, but you still want to save some pennies, you might want to check out Airbnb. While I've had no personal experience with this, it seems like a solid option for budget-friendly accommodation. Where to even start? There's plenty to do on the island in the summer that doesn't cost a ton of money. So to give you a primer for some of the endless things to do on the Vineyard, I'll go through how our two days played out activities-wise. We arrived in the town of Oak Bluffs at about 11 AM, and made a beeline for the picturesque "Gingerbread Cottages," a historic grouping of colorful houses that make up the campgrounds for the Martha's Vineyard Camp Meeting Association. They're truly breathtaking in their incredible detail despite their small stature. We snapped a few pics and rode around the main circle on our bikes a few times (I needed all the practice I could get!) before heading off on the long bike ride to Edgartown. Once we reached Edgartown without too many bike-related mishaps, we headed straight for the beach. While the Vineyard is covered with incredible beaches large and small, there's one gem which has stolen my heart since the first time my family "discovered" it. Lighthouse Beach, just a short walk down a path from the Harborview hotel, is most widely visited for, you guessed it, it's lighthouse. You can go up to the top for a small fee but I'd recommend skipping out on the lighthouse and taking advantage of the often deserted beach that it overlooks. When I brought Ben out to the shore and we were the only ones there he simply said "this is heaven." We soaked up the sun and marveled in the beach's idyllic calmness- that is, until a few more people came to join us. We spent most of our first day at the beach and I'm so glad we didn't bother moving around to different towns on our bikes. After roaming the shops for a while (there's no shortage of those on the island) we made our way up to this raised dock by the water and watched the sunset. And man, was that sunset just perfect. On our second day we ventured further along the island to Aquinnah, known for it's awe-inspiring cliffs and red-brick lighthouse. But first, we made a stop at the famous Alley's General Store (right down the road from the hostel!) for a quick scan of the shelves, which are chock full of anything and everything by the way, and a few snacks. The road to Aquinnah was long and tiring, but we made it with just enough energy to heave ourselves up to the cliffs. The views from the top are stunning, and totally made up for the fact that my legs were throbbing. The cliffs at Aquinnah actually have a long and interesting history, which begins with the legend of how the cliffs were created- the redness comes from the blood of the whales that Moshup the Giant would bring in from the ocean. The tiny shops on the cliffs celebrate this history by selling authentic Wampanoag crafts (as well as a few touristy things here and there). After exploring the cliffs, we headed to the beaches down below for a bit of a different island-vibe, with loud waves crashing into the shore of a rocky beach. Once we had spent a few hours there, we had to make the grueling journey back to West Tisbury (remember what I said about the bus?) before finally catching a different bus back to Vineyard Haven for the ferry ride back. Food is always something that's high up on my priority list. And honestly, I'd blow my budget on food entirely if I could. But since I evidently couldn't do that on this trip, we really had to be careful about where we ate. Much like any vacation destination, Martha's Vineyard can be really pricey if you're not mindful. On the first day we brought a picnic for the beach, with sandwiches, snacks, and a cheeky bottle of wine. For dinner, we planned on eating at The Newes From America Pub at the Kelley House. I had eaten there before with my family and absolutely loved their colonial New England vibe with a modern twist. With live music and a reasonably priced menu it's really the perfect budget-friendly option without sacrificing quality. However, to my disappointment it was closed for repairs! So we had to look elsewhere for dinner. Instead, we opted for what was the #2 restaurant in Edgartown according to TripAdvisor- the Seafood Shanty. I was skeptical at first, but was completely pleased with how our choice turned out! With a rooftop bar and unbeatable views, the atmosphere was enough for this place to be a win. Keeping true to our budget, we decided to split the fisherman's platter ("split" as in, Ben ate way more than I did), and it was just the kind of crispy, fried goodness that we needed after a long beach day. On our second day, we kept things simple by staying in Aquinnah. This definitely limited our options, but we ended up taking a table on the deck of Aquinnah Shop Restaurant to have our fill of creamy clam chowder and sun tea. It was definitely a no-fuss meal, but the views were incredible. My final recommendation is not actually for Martha's Vineyard itself, but for a restaurant in the mainland town where the ferry gets off, Woods Hole. If you find yourself feeling pangs of hunger after your journey back to reality, you should 100% find a spot at Quicks Hole Taqueria and order the lobster tacos and a lobster quesadilla. I swear it will change your life. The soft, buttery lobster paired with creamy queso fresco will have you craving more after the first bite. There are so many reasons to visit Martha's Vineyard on its own that have people clamoring to get to the island every summer (I mean, even the Obama's do it!). But I hope that I've shown you that you don't have to be uber-rich to be able to enjoy the laid-back New England island lifestyle. P.S. Our next weekend whirlwind trip will be to Dublin in October! Any recommendations would be greatly appreciated (I haven't been in 6 years...). Feel free to comment below or send me an email! I've only been to Cape Cod but MV looks so beautiful! It really is! I love the cape too but MV is such a different vibe! Recent Eats: Plus, recipes and cooking tips!